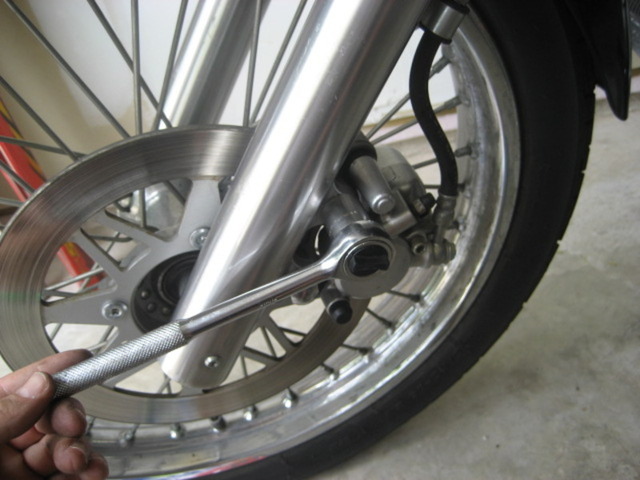 NOTE: there are no spacers between fork and caliper. NOTE: there is a washer and lockwasher under the head of the bolt. 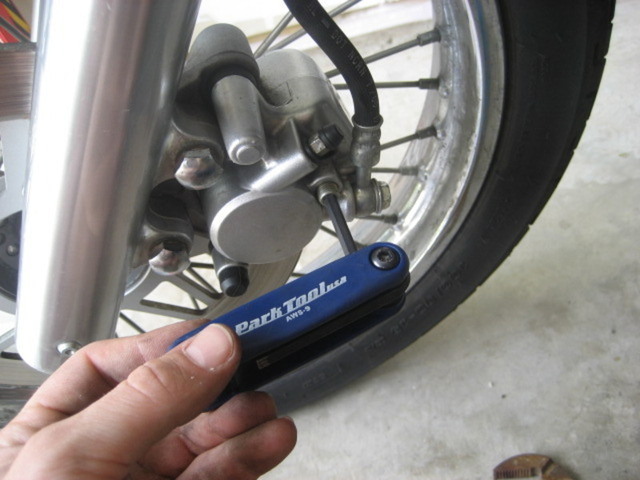 - An old small toothbrush is good for cleaning out the caliper. 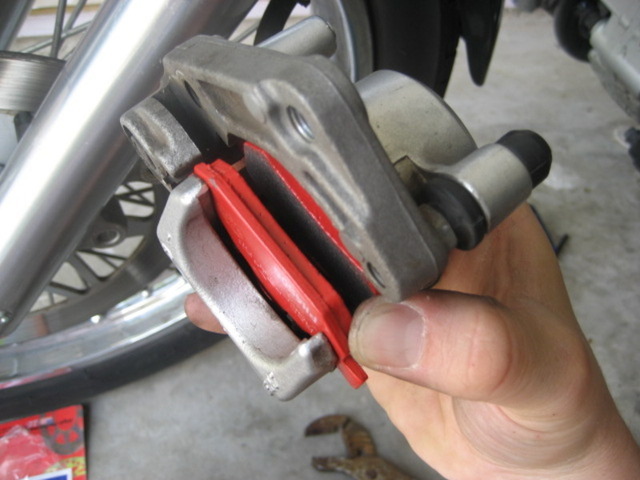 - You can use the old brake pad and a C clamp to help squeeze the piston back into place. Alternately, put the pads back in and use a wedge to push them back open, thus putting the piston back into place. Hammering on the piston is not recommended. 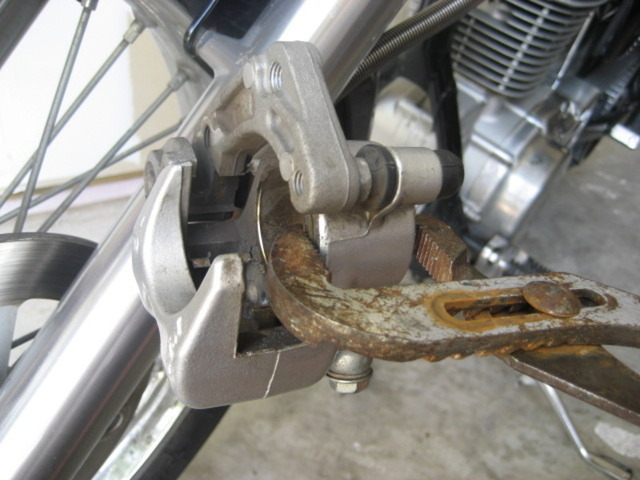 - Take a shop rag or a handful of paper towels and wad them around the brake master cylinder (between that and the handlebar) because sure enough, some of that brake fluid is going to leak out as you remove the lids. Tracking down where the brake fluid dripped and/or missing a spot where it hit your paint is no fun. - A towel draped on the tank can help catch any other brake fluid spills. Good photos. Nice step by step. Good reminder about the brake fluid too. Gotta keep it off the paint. 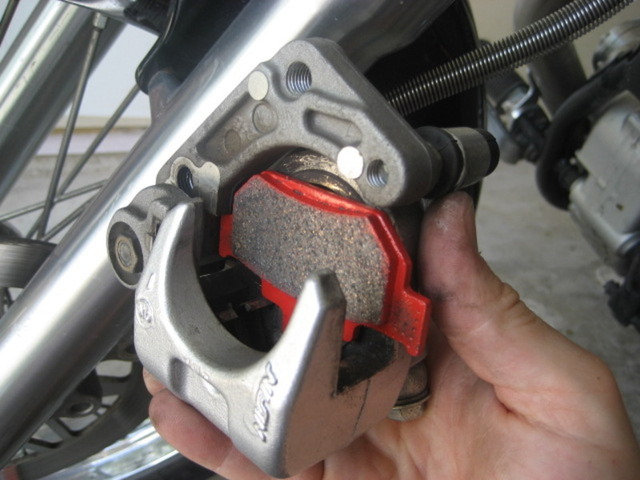 ...I would add that if you are going to compress the caliper piston, that a c-clamp with one of the old pads against the caliper piston face would be best. 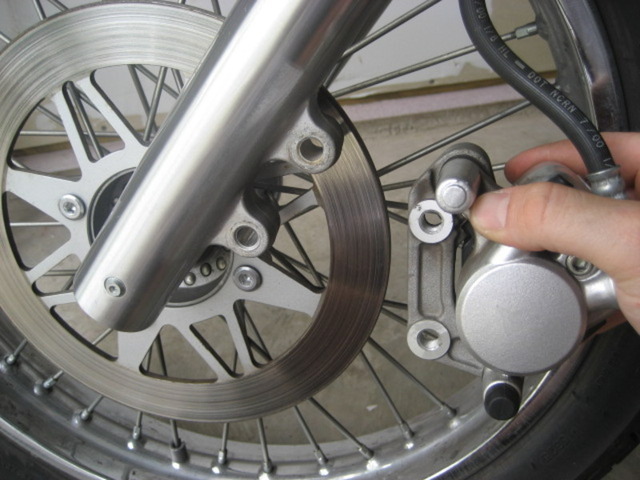 You run the risk of damaging the piston, dust boot, or even the outside of the caliper with the channel locks. A c-clamp provides an even force so as not to score the inside of the caliper by c0cking the piston during the process....especially if the fluid is particularly nasty. PS - I don't know that I have ever been able to compress a caliper piston by hand, so I don't know why Clymer says that. At any rate, you can always get a pad spreader at Harbor Freight too. 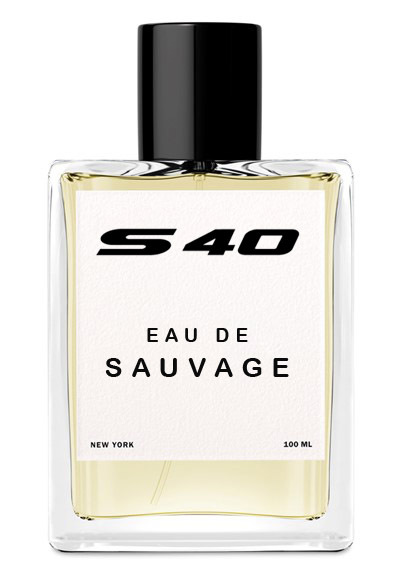 Chapeau, good description and pictures. 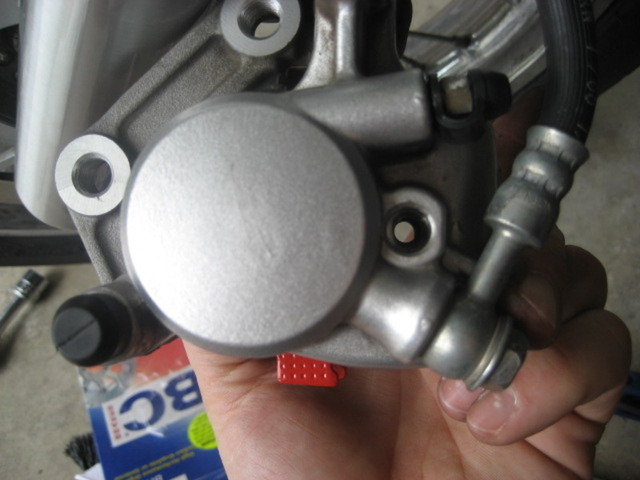 Add: High temp grease to the backside of the pads (piston-side) and the areas that touch the springs inside the caliper. 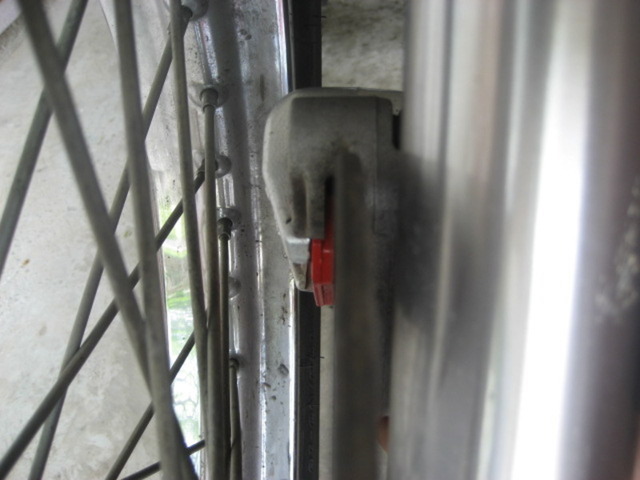 Also put some grease on the brake pad mounting bolt. 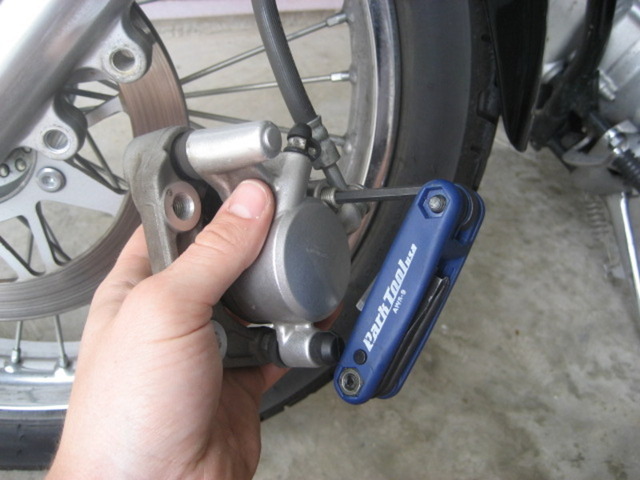 Clean the caliper slide pins and grease 'em a bit with high temperature brake (or silicone) grease. The caliper rides on two posts -- numbers 5 and 7 in the diagram. The posts have flat areas to make room for grease. The small rubber boots help retain the grease and act as wipers/dust seals. 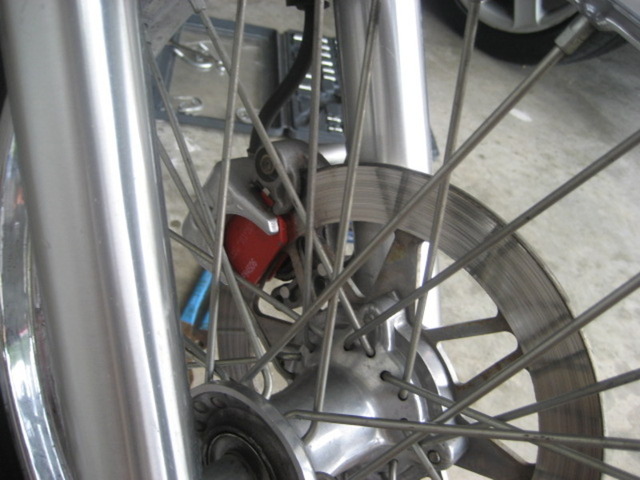 In theory, the caliper is free to slide in and out on the posts to adjust for variations in the rotor. Also, since only the outside brake pad gets pushed, there needs to be some slack in the caliper mount to allow it to squeeze and release. 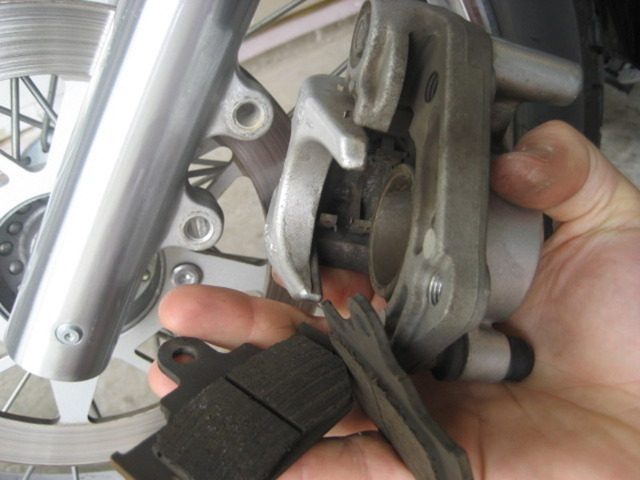 But the grease can get thick, so the caliper doesn't always release fully. That's part of life with this type of caliper. Also, the piston seals might get gummy so the piston doesn't retract much when you release the brake, leaving the outside pad dragging more than usual. So you might at least freshen the grease on the posts. Remove the caliper from the fork and pull it off the bracket. No need to disconnect the hydraulic line. When you put it back together, make sure the ends of the boots tuck into the grooves so you don't lose grease over time and so crap doesn't get in to gum up the grease. Cleaning or replacing the seals means taking everything apart, which is another story. 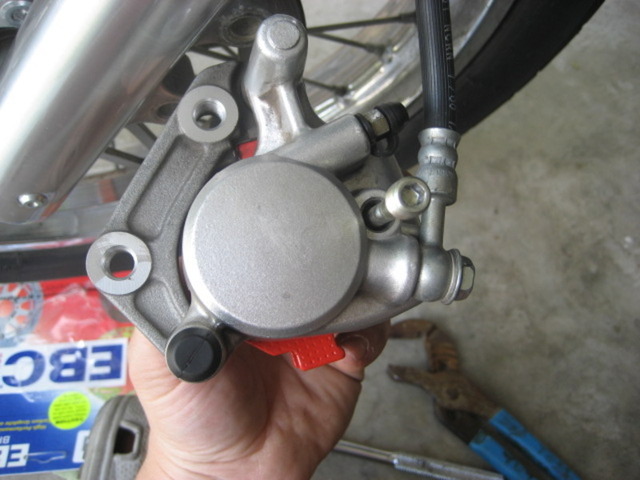 First drain the brake fluid by disconnecting the brake line at the caliper. Be ready with some kind of catch pan and some rags. 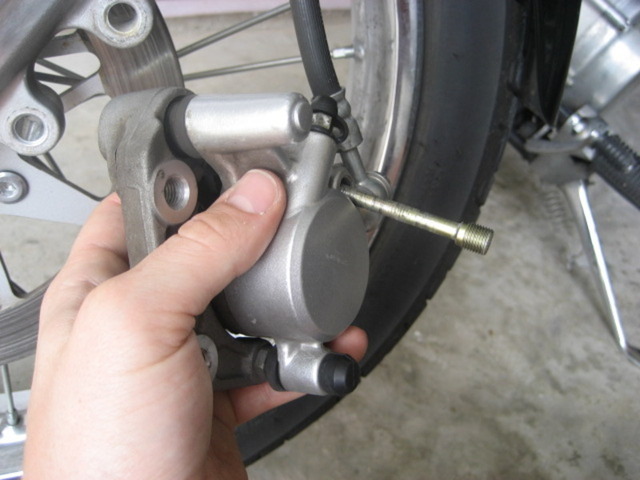 Remove the caliper following the instructions above. 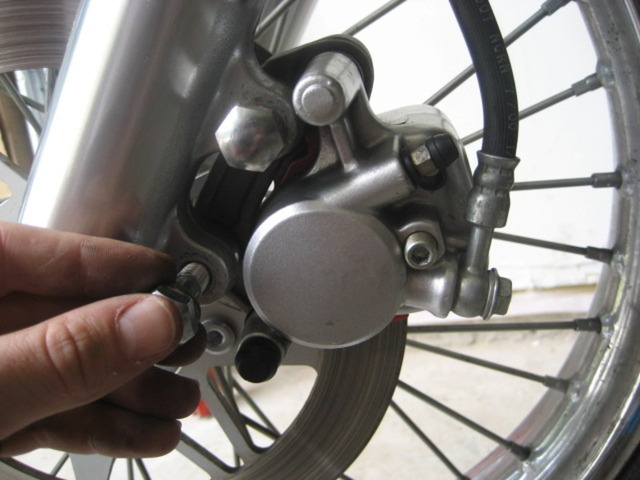 Drain what fluid you can from the caliper. Remove the pads. 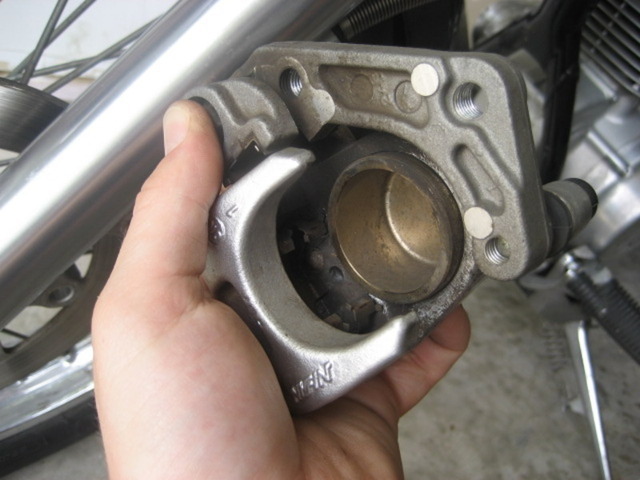 There are two ways to remove the piston. The easy way is to slip the caliper over the edge of a piece of plywood, particle board or masonite (or sheet of steel or aluminum). 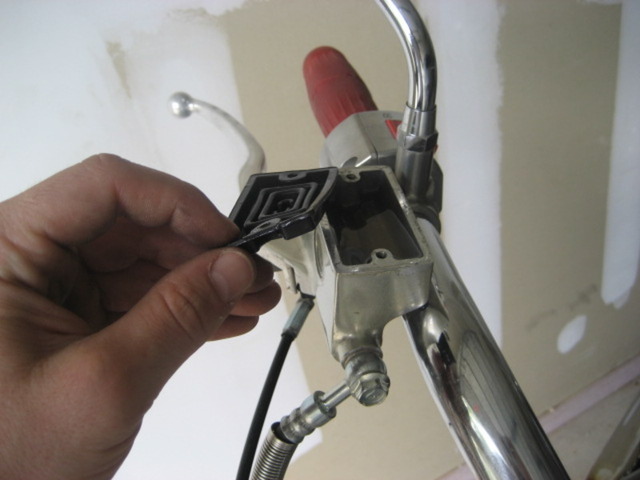 Then use the rubber cone nozzle of an air compresser to shoot a short burst of air into the brake line hole. The wood (or metal) is there to keep the piston from shooting across the garage. It should now be easy to pull the piston the rest of the way out. The other way, if you don't have an air compressor, is to slip as many fingers as you can into the piston and twist as you pull. Fish the seals out of the grooves. 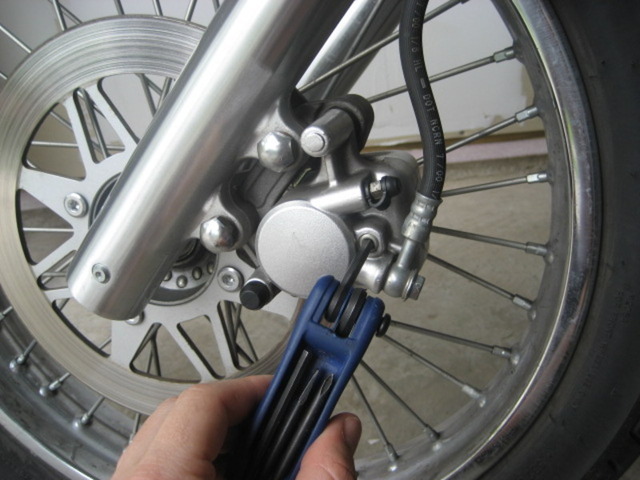 Wipe any remaining brake fluid out of the grooves and the bottom of the piston well. Clean any crud from the grooves. Clean the piston with something that won't scratch it. Wipe the new seals with fresh brake fluid and slip them into place. Run your brake fluid coated finger around them to make sure they're fully seated and not twisted. Using as much finesse as you can, twist and push the piston into the caliber, making sure you don't push the seals out of their grooves. (Remember, the piston goes in open side out.) The piston will probably slide easily past the outer seal and then meet resistance from the inner seal. Take it easy, twist and push. Once past the inner seal, push the piston all the way in. Reassemble the brake. Replaced my pads yesterday, the caliper piston REALLY didnt wanna budge (it even broke my pliers!! see pic). I am sure you all know this tip already but if you find this problem a really good solution is to use some good chrome polish on the piston (after giving the area a good clean obviously), this helps remove any rust that may have formed, after buffing off the polish grease the piston thoroughly, reattach the old disc pad and attach a C clamp to the back of the caliper and the pad (a 3" C clamp is a perfect size). 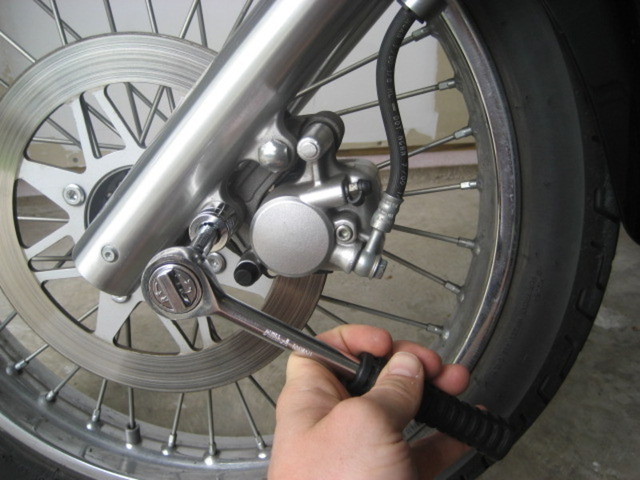 Unless the caliper piston is completely trashed this should slowly force the piston back into the retracted position. You may want to pump the piston back out and repeat the process one more time to ensure that it is fully cleaned of all brake dusk and grime build up and moving freely before installing the new pads. 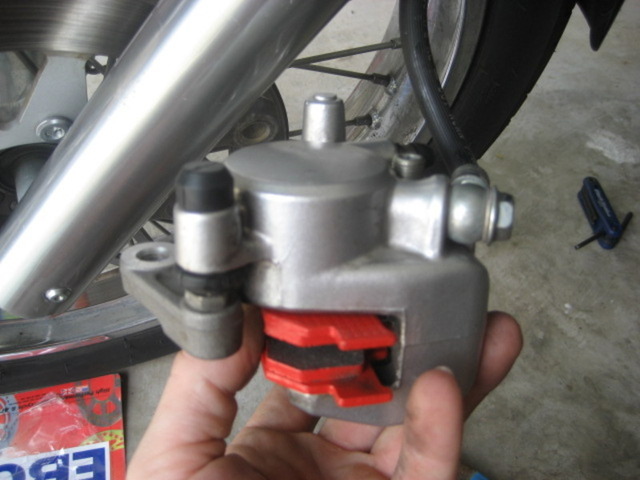 By "Master Cylinder".....do you mean "caliper piston"? Possibly!!! Its been a long day Dave! 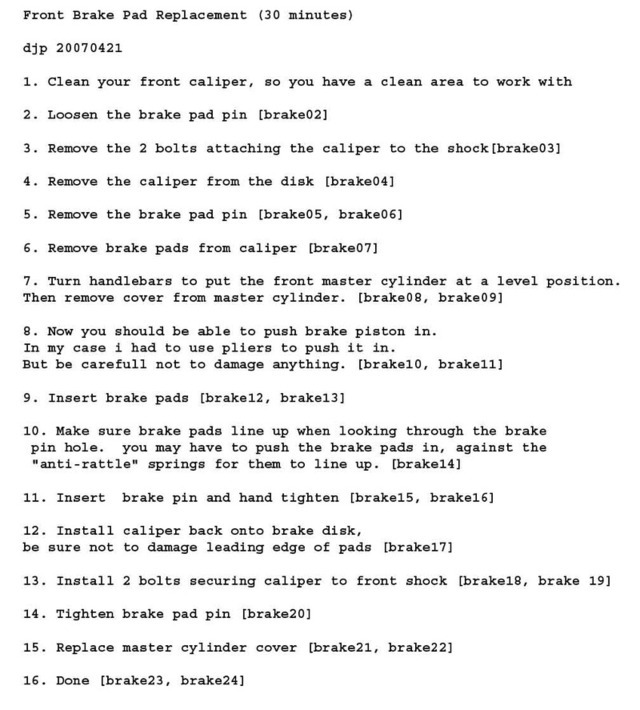 I assume the 'Brakepad mounting bolt' is the brake pad pin which according to the tech section torque specs should be 7.4 to 11.1 ft/lb, apart from the caliper mounting bolts which are correctly listed as 18-29, I can't see what else can be meant by the brake pad mounting bolt other than the brake pad pin? I did this today. I have never done any brake work before. The pics are great and very helpful. 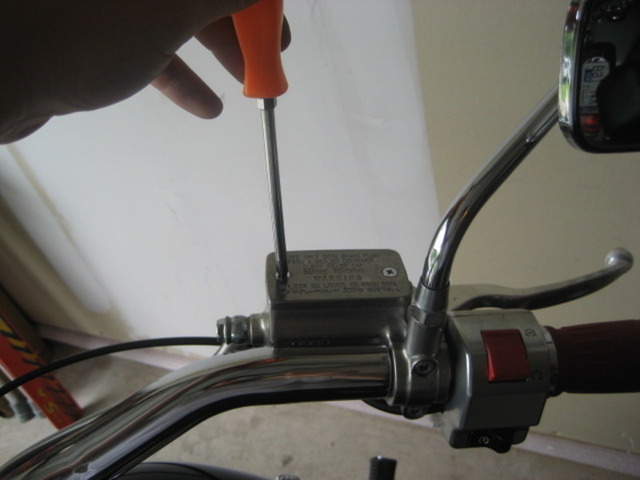 I was able to push the piston in part way using channels but had to finish up using vice grips. 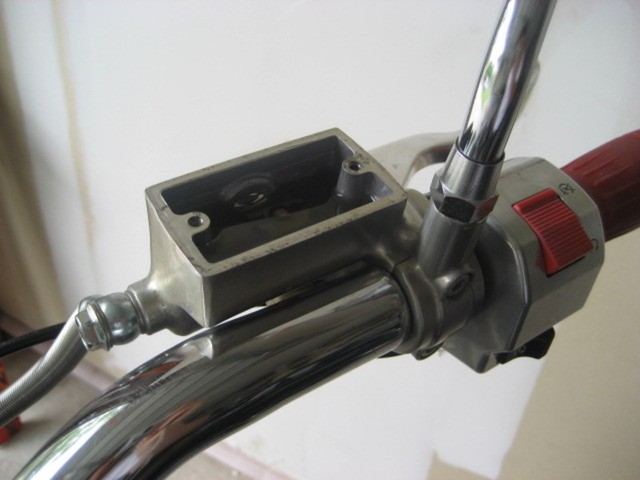 Maybe an additional note... the piston has to be flush or almost flush with the casing. 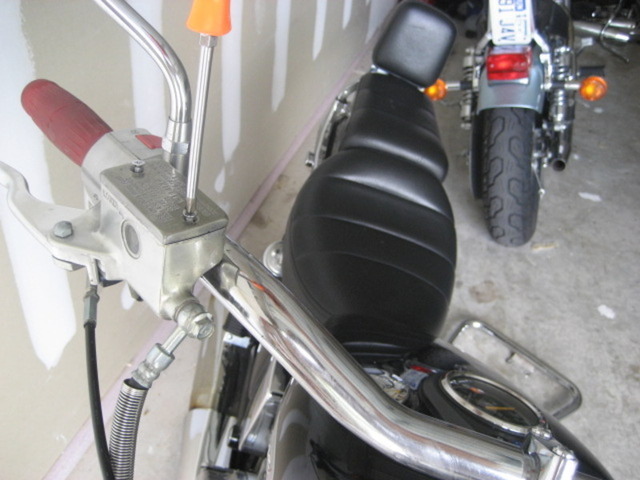 '96 with Voyager kit, White spacer mod, K&N air filter, HD muffler, solo seat/back rest, hard saddle bags and trunk. 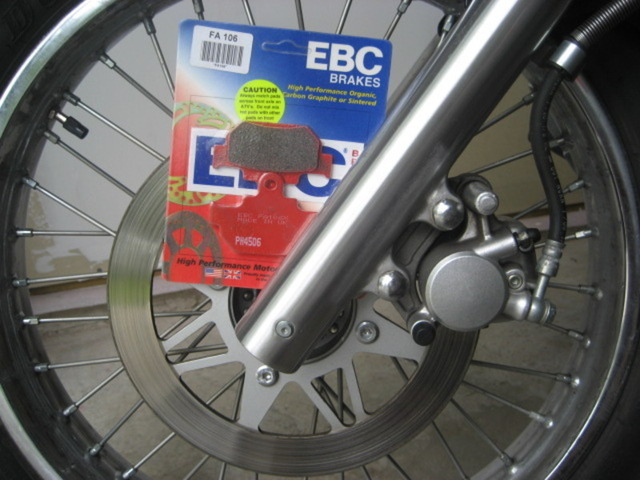 Could you recommend me what Type/Brand of brake pads the best. 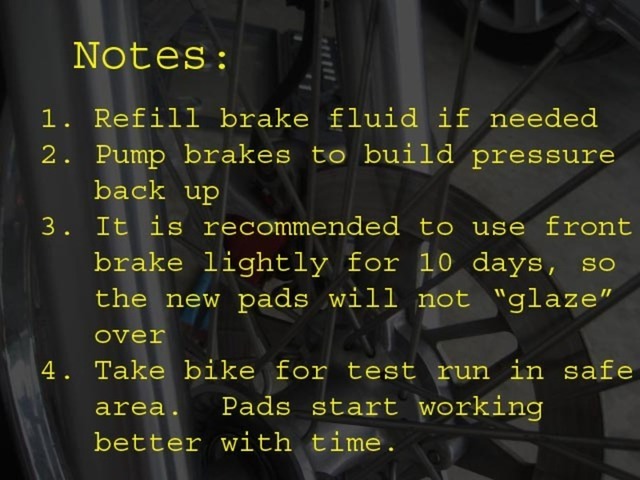 While you're changing the pads, take a look at the color of the brake fluid. If it has a tint at all, it's time to change it. Put a tube on the bleeder and open it up, feed the line into a jar. Let the master drain down to nearly nothing and refill it, then keep it full. You should be done once you've gone thru half a small can. Unless you got another bike, go ahead and pass most of the can cause you'll need another can for next time anyway.